On Sunday, October 26, 2014, the St. Louis Cardinals' promising, young, rookie ballplayer, Oscar Taveras, died. He was only 22-years old. Taveras' 18-year-old girlfriend, Edilia Arvelos, died by his side, in the passenger seat of Taveras' car. Initial reports of the tragic death of these two young people indicated that Taveras was driving his car at a very high rate of speed when he lost control and hit a tree. At the time, there was no indication that drugs or alcohol were a contributing factor. The reaction of the sports world in general, and the baseball world in particular, was immediate and profound shock and despair. Oscar Taveras was recognized with a moment of silence, before the start of Game 6 of the World Series. The Cardinals left the right field lights illuminated in an otherwise darkened Busch Stadium, in tribute and memorial to Taveras. And Royals' pitcher and good friend of Taveras, Yordano Ventura, paid tribute to Taveras by writing the deceased player's initials and uniform number on his hat, before his start during the World Series. What happened to Oscar Taveras and Edilia Arvelos was tragic. Yesterday, the world learned that what happened to Oscar Taveras and Edilia Arvelos was much more than a tragic accident. While tragic, it was not an accident. It was a criminal act. And the perpetrator was Oscar Taveras. What Oscar Taveras did was wrong. Yesterday, the Attorney General's Office of the Dominican Republic revealed that Oscar Taveras was extremely intoxicated when he and Edilia Arvelos climbed into his sports car and headed down the road. His blood alcohol content (BAC) was .287%, which was five times the legal amount of .05% in the Dominican Republic, and more than three times the legal amount of .08% in California. By most calculations, Taveras would have had to consume as many as 15 alcoholic beverages in a two-hour period to have that high a BAC when he put his key in the ignition of his car. What happened to Oscar Taveras and Edilia Arvelos was not an accident. It was a criminal act. And the perpetrator was Oscar Taveras. What Oscar Taveras did was wrong. The above four sentences are not typos of duplication. I intentionally repeated myself. In the minds of many, I'm "piling on." In the minds of many, I'm speaking "ill of the dead." If you continue reading, you will read these four sentences again. Who and what gives you the right to judge, Tony? Some might say I have the life experience that affords me the privilege of judging Oscar Taveras' behavior at the moment of his death. This experience began with the death of Mahria's cousin. Thirty years ago she was killed by a fellow high school student. She decided to climb into the passenger seat of his car. He was intoxicated. He hit a tree. She was thrown from a car and was killed when she hit her head on the roadway. My personal experience grew when my mother, who was an alcoholic, was arrested for drunk driving and spent the night in jail. I've seen in my personal life the criminal nature of drunk driving and the life-altering, often life-destroying, effects of such a selfish act. Others might point to my several years of professional experience as a Drug Recognition Expert and DUI enforcement specialist for the Los Angeles County Sheriff's Department, as justification for passing judgment on Taveras. Such was my commitment to removing drunk drivers from the streets of my community that one year I was a recipient of the Mothers Against Drunk Driving (MADD) Century Award, which was given to law enforcement professionals who made more than 100 DUI arrests during a calendar year. Having arrested literally hundreds of drunk drivers, and having had to knock on too many doors late at night to inform someone that their loved one wasn't coming home because he or she was killed by a drunk driver, my experience regarding drunk driving exceeds that of most people. Again, some might think that gives me the right to judge Taveras. However, my personal and professional experiences regarding drunk driving do not give me the right to judge Oscar Taveras. Why? My experiences are nothing more than an arbitrary standard for judging the morality of others. My experiences might give me more "street cred" in passing judgment on Taveras. My experiences might warrant the right, in the minds of other people, to be heard on the subject of drunk driving and the death of Oscar Taveras and Edilia Arvelos. But if my experiences are the standard by which I get to judge Oscar Taveras, then someone with a different set of experiences can come along and say, based on their own personal and professional experiences, that I don't have the right to judge Taveras. When morality (the standards for right and wrong) are arbitrarily determined by the individual, or even by a society, then no moral standard exists that is universally applicable to every person, all the time. If each individual or each society self-determines morality, then, "Let us eat and drink, for tomorrow we die" (Isaiah 22:13; 1 Corinthians 15:32)! If each individual or each society self-determines morality, then no one but Oscar Taveras can judge whether his actions on October 26, 2014, were right or wrong, good or bad. Yet I stand by my judgment. What happened to Oscar Taveras and Edilia Arvelos was not an accident. It was a criminal act. And the perpetrator was Oscar Taveras. What Oscar Taveras did was wrong. This is not my opinion. This is not my arbitrary conclusion. This is the truth--not because I say so. This is the truth because I appeal to a standard outside of myself, outside of acceptable societal norms. This is the truth because I appeal to the One who is perfectly moral, holy righteous, just and good. I appeal to the One who alone has determined the standard of right and wrong--a universal standard that applies to all people, all the time. God--the God of the Bible--the only true and living God (Deuteronomy 4:32, 35, 39; Isaiah 42:8; 45:5-6)--is the only true and right standard for morality (Isaiah 6:3; Matthew 5:48; Romans 3:4; Titus 1:2; Hebrews 6:18). The truth of God's Word not only gives me the right to judge the actions of Oscar Taveras, on October 26, 2014; God's Word gives me the responsibility to do so (Romans 12:2; Ephesians 5:8-11; Hebrews 5:14). But the Bible says, "Judge not that you be not judged" (Matthew 7:1), Tony. "Judge not, that you be not judged. For with the judgment you pronounce you will be judged, and with the measure you use it will be measured to you. Why do you see the speck that is in your brother's eye, but do not notice the log that is in your own eye? Or how can you say to your brother, 'Let me take the speck out of your eye,' when there is the log in your own eye? You hypocrite, first take the log out of your own eye, and then you will see clearly to take the speck out of your brother's eye'" (Matthew 7:1-5). I can point a judgmental finger at Oscar Taveras. I can point to the speck in his eye--a speck that resulted in his death and the death of his girlfriend. I can do so because I do not have a log in my own eye. I'm not hypocritically judging Oscar Taveras. I've never been intoxicated. I've never had more than a single glass of wine or champagne, in a sitting. I've never had a beer in my life. And I've never driven a car while under the influence of drugs or alcohol. I'm not judging Oscar Taveras by comparing him to what I errantly see as my own perceived goodness. I'm not judging Taveras by appearances. I'm not judging Taveras by asserting that I am somehow better than he was. I'm judging Taveras with right judgment--a right judgment derived from the truth of God's Word. 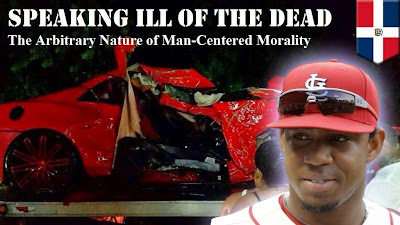 Oscar Taveras violated God's moral standard--a standard God delineates throughout His Word. Oscar Taveras got drunk. "And do not get drunk with wine, for that is debauchery, but be filled with the Spirit" (Ephesians 5:18). Oscar Taveras broke the law. "Let every person be subject to the governing authorities. For there is no authority except from God, and those that exist have been instituted by God. Therefore whoever resists the authorities resists what God has appointed, and those who resist will incur judgment. For rulers are not a terror to good conduct, but to bad. Would you have no fear of the one who is in authority? Then do what is good, and you will receive his approval, for he is God's servant for your good. But if you do wrong, be afraid, for he does not bear the sword in vain. For he is the servant of God, an avenger who carries out God's wrath on the wrongdoer. Therefore one must be in subjection, not only to avoid God's wrath but also for the sake of conscience" (Romans 13:1-5). Oscar Taveras likely thought he was okay to drive. "Never be wise in your own sight" (Romans 12:16). Note: For those who would like to minimizes Taveras' wrongdoing by assuming October 26, 2014, was the first time he drove drunk, well-established statistics disagree with you. Even at his young age, it is possible, even likely, that Oscar Taveras drove drunk as many as 80 times before he hit that tree. It's also important to note that the age group with the highest percentage of drunk driving incidents is 21-25. And Oscar Taveras, on October 26, 2014, did not love his neighbor as himself. "And [Jesus] said to him, 'You shall love the Lord your God with all your heart and with all your soul and with all your mind. This is the great and first commandment. And a second is like it: You shall love your neighbor as yourself. On these two commandments depend all the Law and the Prophets'" (Matthew 22:37-40). While Edilia Arvelos was responsible for her actions--responsible for getting into the car with Oscar Taveras, in his heavily inebriated state--Oscar showed no love for Edilia when he got behind the wheel of that car and then killed her when he hit the tree. Is Oscar Taveras in Hell? 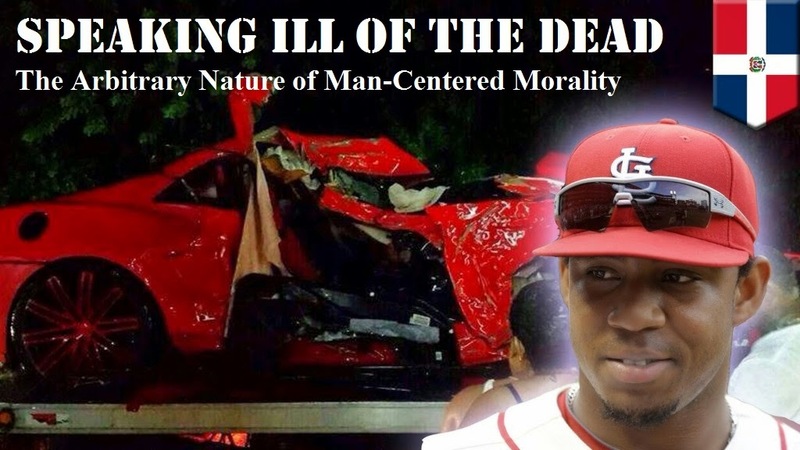 Some on social media have assumed the authority of God by asserting with arrogant, definite confidence that Oscar Taveras will spend eternity in hell, as a result of his actions on October 26. Those who are doing this have no such authority. God and God alone has the authority (James 4:12). Is Oscar Taveras in hell? The only honest answer is, "I don't know." I have no idea where either Taveras or Arvelos will spend eternity--heaven or hell. What I do know is this. If, prior to their death, they received Jesus Christ as their Lord and Savior--by the grace of God alone (Ephesians 2:8-9), through faith alone (Romans 1:17), in Jesus Christ alone (John 14:6)--they now and forever will enjoy fellowship with Jesus Christ in heaven. 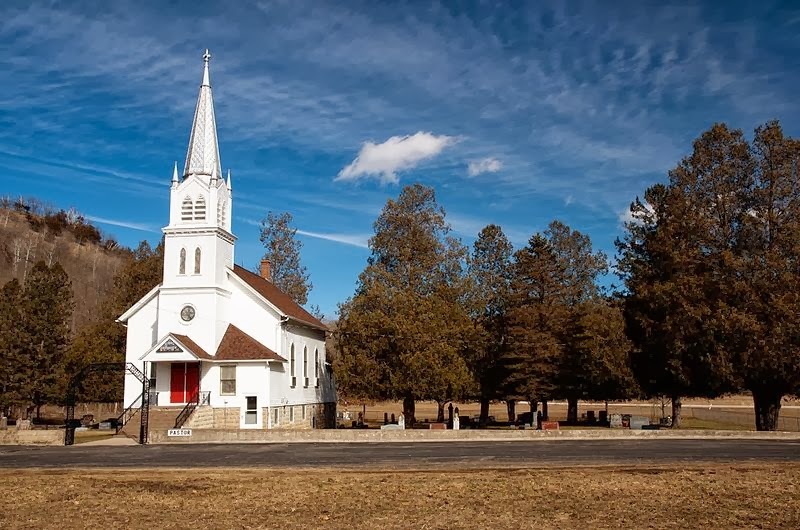 If, prior to their death, they repented and believed the gospel of Jesus Christ (Mark 1:15; Romans 3:21-26; 1 Corinthians 15:1-6; 2 Corinthians 5:21), then they have received the forgiveness, grace, mercy, and love of God. Taveras' and Arvelos' bad acts on October 26 were not unpardonable sins. However, if they died in their sins (John 8:24), if they died having rejected the lordship of Jesus Christ (Philippians 2:9-11), if they died having rejected salvation through Christ alone (Acts 4:12), then they will spend eternity in hell as the just punishment for their sins against God (Revelation 20:11-15). My hope is that both Oscar Taveras and Edilia Arvelos are in heaven. To hope the alternative would be hateful (1 John 3:15) and bring my own salvation into question (Matthew 5:21-22; Revelation 21:8; 2 Corinthians 13:5). Have I really spoken ill of the dead? Not at all. I've spoken truth--not my truth; not your truth; God's truth. Have I sat in judgment of Oscar Taveras? Yes--but I believe I've done so within the confines of Scripture and the limitations the Word of God places upon me (John 7:24). 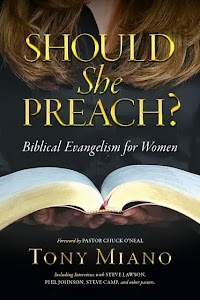 Some well-meaning Christians will suggest that while I may have the biblical justification for what I've written, the timing of my article lacks sensitivity and compassion. After all, this tragedy is still fresh in the hearts and minds of people literally around the world. People are still mourning the loss of two young people. Family members are grieving. I certainly don't want to be insensitive to those who are grieving and mourning the loss of Oscar Taveras and Edilia Arvelos. After all, the Bible says that we should weep with those who weep (Romans 12:15). Light removes darkness and heat purifies that which is tainted. I cannot darken or taint the reputation and/or memory of Oscar Taveras by shining the light and applying the heat of the truth of God's Word to what he did. The light and heat of God's Word doesn't created darkness or impurity; it exposes the darkness and impurity (sin) that is already there. 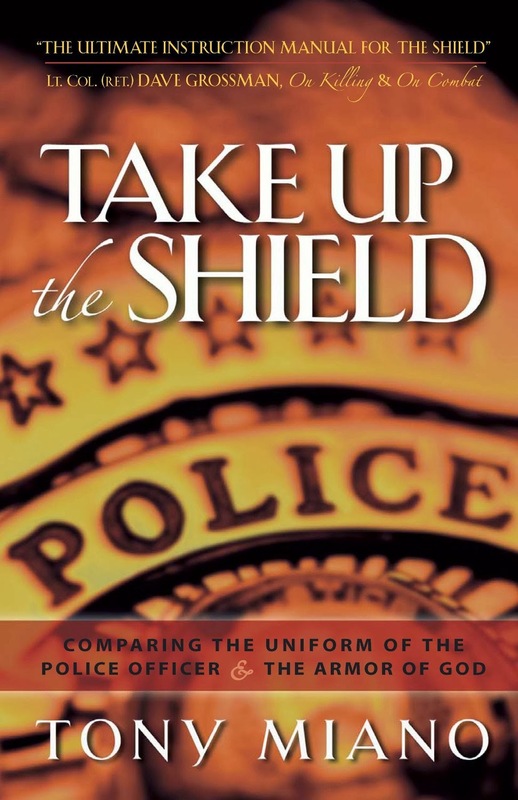 My hope is that people who read this article will consider the arbitrary, non-binding nature of their man-centered morality and consider the reality of their own spiritual condition in light of the standard by which they will one day be judged--God's standard. When you die and stand before God, you will give an account for your life. “And just as it is appointed for man to die once, and after that comes judgment” (Hebrews 9:27). If you've ever lied, stolen, taken God’s name in vain, harbored hatred or lust in your heart, or sinned against God in any way, He will judge you as one who has broken His law. God’s punishment for sin is eternity in Hell. God has provided only one way for you to receive forgiveness of your sins and the joy of eternal life in Heaven. God the Father sent His Son to earth in the person of Jesus Christ—fully God and fully Man, who knew no sin. He voluntarily went to the cross where He shed His innocent blood and died, taking upon Himself the punishment you deserve. God the Son subjected Himself to the wrath of God the Father in order to pay the ransom (the sin debt) for many. Three days later, He defeated sin and death when He rose from the grave. What God commands you to do is repent (turn from your sin and turn to God) and, by faith alone, receive Jesus Christ as your Lord and Savior. There a couple of additional things about which I am certain: 1) the death of Oscar Taveras and Edilia Arvelos was indeed a tragedy; 2) tomorrow is not promised. "Come now, you who say, 'Today or tomorrow we will go into such and such a town and spend a year there and trade and make a profit'— yet you do not know what tomorrow will bring. What is your life? For you are a mist that appears for a little time and then vanishes. Instead you ought to say, 'If the Lord wills, we will live and do this or that.' As it is, you boast in your arrogance. All such boasting is evil. So whoever knows the right thing to do and fails to do it, for him it is sin" (James 4:13-17). Life is a mist, a vapor. It is here today and gone tomorrow. In fact, tomorrow is not promised. I wonder if anyone ever told Oscar or Edilia that. "For he says, 'In a favorable time I listened to you, and in a day of salvation I have helped you.' Behold, now is the favorable time; behold, now is the day of salvation" (2 Corinthians 6:2). I wish I had been given the opportunity to take the keys from Oscar Taveras, before he got into that car with Edilia. I wish I had been given the opportunity to share the gospel with the two of them, before they got into that car. But I thank God I've been given the opportunity to share the gospel with you, the reader. I just hope I never have to write an article like this about you. Repent and believe the gospel while God has given you time.